We see a lot of golfers missing out on the real sweet feeling of solid iron contact because they’re making either "fat" or "thin" contact. 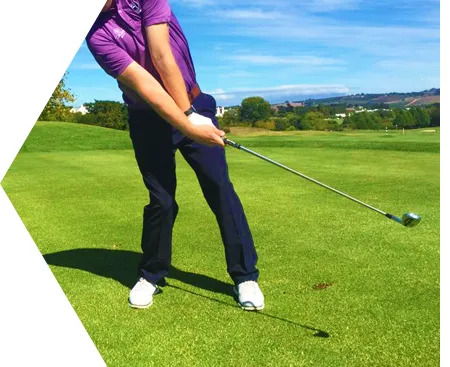 In this image, in an attempt to get the ball airborne the golfer is trying to strike the ball with an ascending blow by moving their weight away from the target (to their back foot) on the downswing. 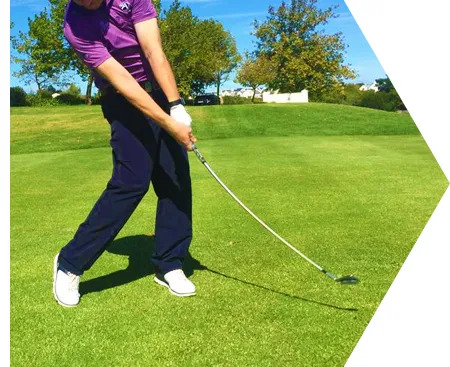 During the downswing weight should move from the back foot to the front foot towards the target, encouraging a slightlydescending, ball-first contact. During the downswing weight should move from the back foot to the front foot towards the target, encouraging a slightly descending, ball-first contact.